What is the point of defensive cricket if your out for peanuts? Play the natural game and at least score some runs! Nathan Lyon comes back on for the final over of the day. Can he complete a great day by taking his fifth wicket? Bresnan takes a single. Lyon has three balls at Anderson to complete a perfect day. It's not to be. Anderson crashes another boundary off the back foot and safely negotiates the last two deliveries. That. Is. Stumps. 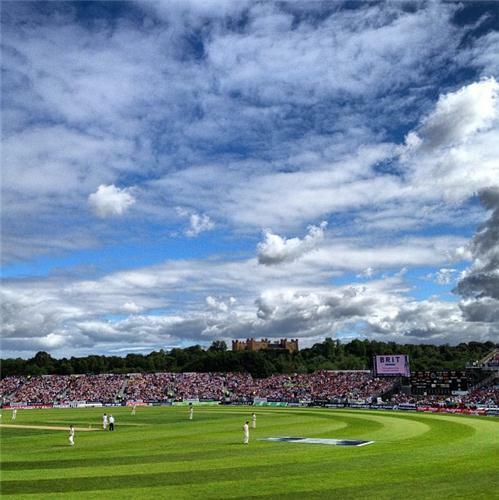 After winning the toss, England produced a poor batting display that saw them end the day tottering on 238 for nine. The England innings oscillated from obdurate defence to ill-judged shots with very little in between. They crawled to 57 for one at lunch. The afternoon session began more brightly and England were enjoying their best period of the day when Trott fell to spinner Nathan Lyon for 49. Australia then nipped out Cook and Pietersen before tea and when Ian Bell chipped Lyon to Ryan Harris just four balls after the break, England were deep in trouble. Australia kept the pressure on throughout the evening session taking regular wickets. They even used the DRS with some aplomb to get rid of Matt Prior LBW. James Anderson crashed some late boundaries as England just about survived until stumps but the Australians walked off more than satisfied with their work. Without question, it was their day. Good morning from the Riverside. 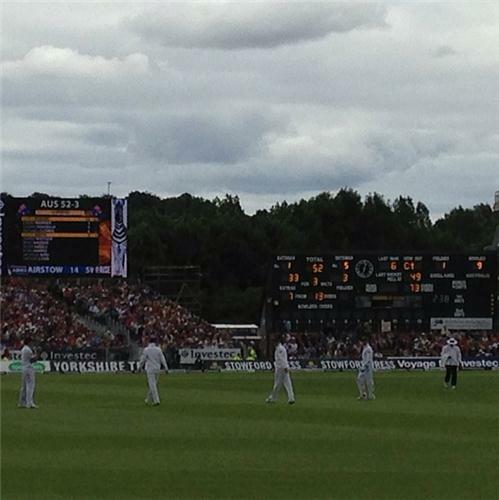 England resume 238/9 with the Burnley Lara and Bresilad at the crease. They'll be looking to push England on past 250. 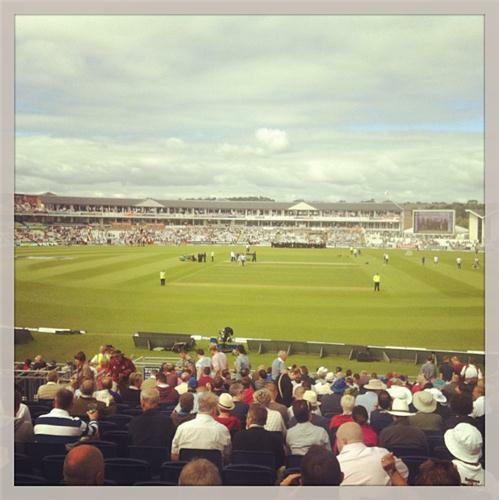 Whilst we're waiting for the first ball - here's my report from yesterday. Matt Prior's wicketkeeping really has been a scruffy old thing in this series. Smith gets his first boundary with a flick behind square. Rogers is very experienced in these conditions having played so much domestic cricket in England. England didn't add to their overnight score of 238. Australia found themselves quickly 2 down when Warner was bowled by Broad and Khawaja followed him back to the pavillion 2 overs later. There was another DRS controversy when Rogers was given out caught behind by Tony Hill, He reviewed and it was clear that he hadn't hit but that it was going on to be umpire's call on LBW. Hill thought that meant it stuck with the original on field out call but Aleem Dar clarified that the out decision was for caught behind so Rogers wasn't out LBW. Confused? Me too. Michael Clarke was then caught by Cook in the slips in the 13th over leaving Australia in trouble at 49/3. Stuart Broad in particular bowled a fantastic new ball spell with venom and aggression picking up 3 wickets for 23 runs off 7 overs. Rogers and the new man Smith pushed the scoring rate very effectively and Rogers, in particular, looked very well organised. Australia go to lunch 75/3 . Welcome back. Trust you all had a nice lunch. So this is the Watson at 6 experiment. So far so good. Well ok.